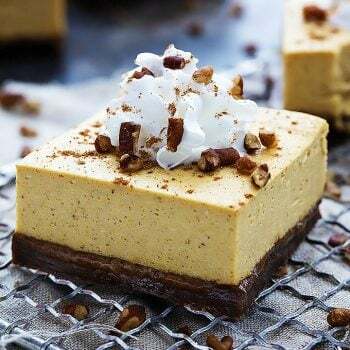 Creamy, rich pumpkin cheesecake bars with chewy gingersnap crust, topped with whipped cream and pumpkin pie spice! Preheat oven to 350. Line an 8x8 inch baking pan with foil and lightly grease. In a food processor combine the gingersnap cookies, sugar, and cinnamon and pulse until fine crumbs form. Add melted butter and pulse again until mixture is completely moistened. Press gingersnap mixture into the bottom of your prepared baking pan. Bake for 10 minutes. While crust is baking, prepare the cheesecake layer. Mix together egg and sugar until light and foamy. Add cream cheese, pumpkin, pumpkin pie spice, and vanilla and mix until smooth. Pour over baked crust. Return pan to oven for 25-30 minutes until cheesecake layer is set. Allow to cool on a cooling rack for 10-25 minutes, then transfer to fridge to chill completely. Cut into squares and top with whipping cream, chopped nuts, and sprinkled cinnamon or pumpkin pie spice and serve.